Doctors and experts are baffled by an Indian hermit who claims not to have eaten or drunk anything for several decades - but is still in perfect health. 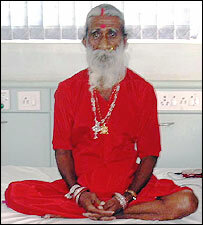 Prahlad Jani, a holy man, or fakir, who is over 70 years old, has just spent 10 days under constant observation in Sterling Hospital, in the western Indian city of Ahmedabad. During that time, he did not consume anything and "neither did he pass urine or stool", according to the hospital's deputy superintendent, Dr Dinesh Desai. Yet he is in fine mental and physical fettle, say doctors. Followers of Indian holy men and ascetics have often ascribed extraordinary powers to them, but such powers are seldom subject to scientific inspection. "A series of tests conducted on him show his body mechanism is that of a normal person," said Dr Desai. Mr Jani spends most of his time in a cave near the Ambaji temple in Gujarat state. He spent his 10 days in hospital in a specially prepared room, with a sealed-off toilet and constant video surveillance. To help the doctors verify his claims, Mr Jani agreed to avoid bathing for his time in hospital. The only fluid he was allowed was a small amount of water, to use as mouthwash. One hundred millilitres of water were given to him, and then collected and measured in a beaker when he spat it out, to make sure none had been drunk. A statement from Ahmedabad's Association of Physicians says that despite no water entering his body, urine nonetheless appeared to form in his bladder - only to be re-absorbed by the bladder walls. At the end of his confinement, doctors noted no deterioration in his condition, other than a slight drop in his weight. "I feel no need for food and water," says Mr Jani, who claims he was blessed by a goddess at the age of eight and has lived in caves ever since. He grew up in Charod village in Mehsana district and wears the dress of a devotee of the goddess Ambaji - a red sari-like garment, nose ring, bangles and crimson flowers in the hair. He also wears the vermilion "tika" mark on his forehead, more often seen on married Hindu women. His followers call him "mataji" or goddess. He says he has survived several decades without food or water because of a hole in his palate. Drops of water filter through this hole, he says, sustaining him. "He has never fallen ill and can continue to live like this," said Bhiku Prajapati, one of Mr Jani's many followers. "A hole in the palate is an abnormal phenomenon," says Dr Desai. His colleague, Dr Urman Dhruv, told the BBC a full medical report is being prepared on Mr Jani's 10 days under observation. Doctors say they cannot verify his claim to have not eaten or drunk for decades - but by observing his feat under laboratory conditions, they hope to learn more about the human body.